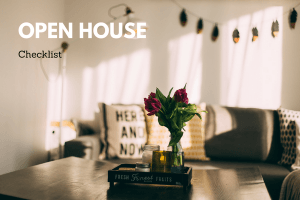 You are finally ready to list your home and you are getting ready for the open house this weekend. You’ve already done a lot of tiding up before this point, but what other things should you do to make sure your home shows like a 10? Check out our list below to make sure you are ready to wow potential buyers! ___ Create a bright, cheerful and serene environment. ___ Open curtains, drapes and blinds, and turn on lights in all rooms and closets. ___ Add a welcome touch by baking some cookies and putting out some fresh flowers. ___ Water interior plants and throw away old plants and flowers. ___ Put away valuables, money, jewelry and medicines in a safe or concealed place! ___ Remove clutter from foyer/entry and make sure it welcomes you. ___ Have a clean welcome mat and clean all windows and mirrors. ___ Make beds, organize clothes, toys and closets, straighten up pillows and bedspreads. ___ Clean wastebaskets, dust blinds, doors, shelves and floors, vacuum carpets. ___ Open all blinds and hang them to a uniform height. ___ Hang clean hand towels, put out fresh soap in clean soap dishes. ___ Remove all personal hygiene products from vanity and close the commode lids. ___ Put out a fresh box of tissues and toilet paper. ___ Clean bathtubs, shower stalls, vanities, sink areas, mirrors and medicine cabinets. ___ Install new shower curtains, if necessary. ___ Remove mildew from walls and caulking. ___ Clean countertops, stovetops, refrigerator doors and handles. ___ Clean the kitchen sink and put away all dishes. Make sure everything shines including your windows! ___ Consider setting your dining room the table with linen and china. ___ Place an attractive centerpiece on your dining room table. ___ Dust the chandelier and replace all burned out bulbs, dust china cabinets. ___ Dust, polish, vacuum and clean floors and furniture. ___ Adjust couch cushions and pillows. ___ Clean up wood around the fireplace and light your fireplace during cold weather. ___ Dispose old newspapers and mail. ___ Organize bookshelves, reduce all clutter.